We’ve all been to a business expo and had a hit or miss experience. Now, I firmly believe that expos are brilliant for small businesses. Particularly the smaller, local ones. At this point, you might be thinking: “Well, you would say that you’re a marketer.” But there really are a multitude of reasons why they are great. That’s why I decided to interview Carlene Bender, who is the powerhouse behind the Ealing Business Expo. Carlene’s going to tell you why you should be using expos to raise your visibility to find new customers. Grab a cuppa, because there is so much useful advice in this interview! Minal: tell me a bit about your business. What do you specialise in? 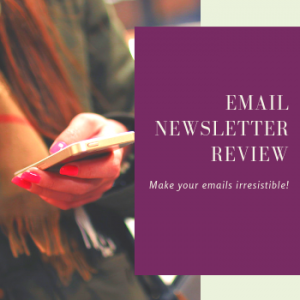 Carlene: Contactus (yes, that is the spelling – one word, no capital U) is the overall name for my business which includes Contactus Ealing, Ealing Business Expo, and Events Booster. I provide promotional services for small to medium-sized businesses. I do this by creating options for business owners to use for marketing and public relations, to spread the word about the good work that they are doing. These options include magazines where they can advertise and be featured; business shows where they can exhibit or make presentations; meetups where they can network and forge connections; and social media channels where their messages can be shared and reach new audiences. Minal: When did you start your business? Carlene: I had been self-employed as a freelance journalist for a long time, over 20 years. In 2012, inspired by the local community spirit after the Ealing Riots, I decided to start up my own business promoting local shops and services in Ealing. ‘Contactus Ealing’ began as a magazine publishing business, focused on showing off the good sides of local business. While there might have been negative aspects of the local business scene, I preferred to promote the positive, such as news about business collaborations, networking groups and events, features about how businesses were helping the community, and photos and artwork that made local shopping parades look good. My intention was to feed that positive feeling about business in Ealing and help it to grow. Minal: You’re the brains behind The Ealing Business Expo, tell us how you got started. Carlene: In 2015, Ealing Council asked me to put on a local business show, which they sponsored, followed by a smaller show just for Acton businesses in 2016, which they also fully sponsored. The buzz and the feedback from these events were so positive that in 2017 I decided to keep the event going, despite it no longer being an Ealing Council event. 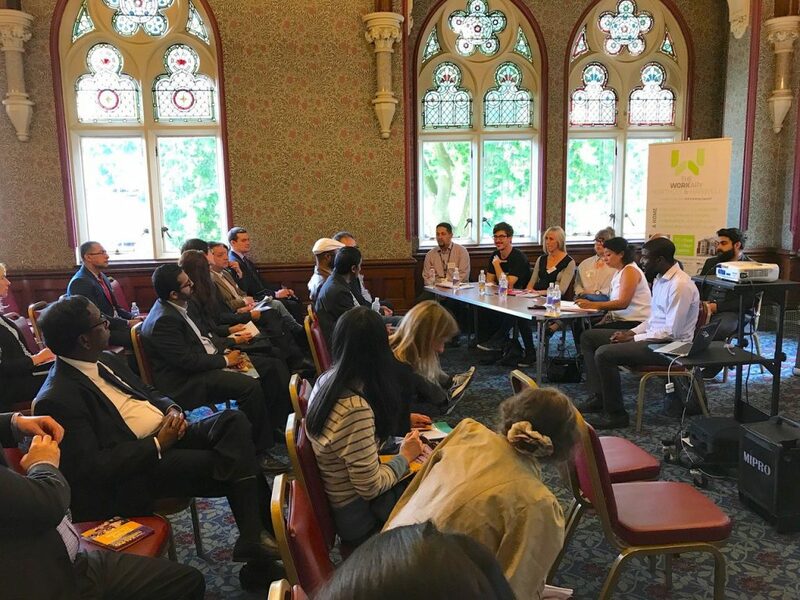 Ealing Business Expo was incorporated as part of the Contactus Network and has become a much-anticipated date on the Ealing business calendar. The next Expo is set for Monday 18 March 2019 at the DoubleTree by Hilton hotel on Ealing Common, and well over 500 people have already registered to attend. Minal: Why do you think these types of expos are crucial for local businesses? Carlene: Many self-employed people (i.e. the type of people who run most businesses in Ealing) have told me that they feel as though their businesses exist in a kind of bubble. Transactions take place remotely via email and social media, they have no staff and so no staff interaction, and many are home-based companies. Even though they try to attend networking events, and arrange 1:1 meetings, they still feel isolated. So, a big, social, busy, and if I may say it, noisy, event like a business show, full of face-to-face connections, with attendees ready to do business, and crammed with opportunities for brand awareness promotion, alongside masterclasses for knowledge-building and skills practice, is something that we needed in Ealing. It’s an event for business people to plan their marketing campaigns around, an event to look forward to every year and to expect to gain lots of business from. The advantage of it being a local business show, as opposed to a general business event, is that key factor in common: Ealing. Plenty of the attendees will be able to recognise one another from social media or from other parts of their busy lives, making it that much easier to break the ice and move on to the next step: a client-provider relationship, or a collaboration, or a simple direct sale. To sum it up, I think a local business expo is good for local businesses because it helps to connect members of the business community, it strengthens local business networks, reduces isolation, and keeps money in the community. Will you be there? Let me know in the comments! Minal: What will someone who attends an expo get from it? Carlene: What visitors to an expo get out of it depends on how much they engage with the event. It starts long before they even get to the event venue on the day. By pre-registering to attend, they will receive regular email updates about the event which means they can plan their time at the expo, including which stands they would like to visit, which talks interest them, and which networking session they might need to register for separately. At Ealing Business Expo, while visitors won’t have the same level of exposure and visibility as exhibitors, there are plenty of ways for them to promote their own businesses. They can sign up for the speed networking sessions, pin their card to the event notice board, or use the event hashtag (#EalingBizExpo) on social media, which will get picked up and shared to the wider Expo community. Even if a visitor only sits in on any of the talks or presentations, s/he will still come away feeling inspired and rejuvenated. Most visitors will, however, probably end up in conversation with other visitors, as well as exhibitors, and will find it difficult not to get involved in the event. As one visitor, who was shy of networking events and only came for the last hour of the previous Expo, said to me: “I’ve learned so much about business in one hour here, imagine how much I would have gained if I had come for a longer time”, and promised to get involved from early with our next event. The ‘Visit’ page on the Ealing Business Expo website has a breakdown of what is taking place on the day. Minal: What about exhibitors? Why should they spend time and money exhibiting? Carlene: Exhibiting at a business expo is the best way for a business to get the most out of the event. Expos are built around the exhibitors, as the exhibition fee they pay allows the event to happen at all. For exhibitors, the expo isn’t just about one day. 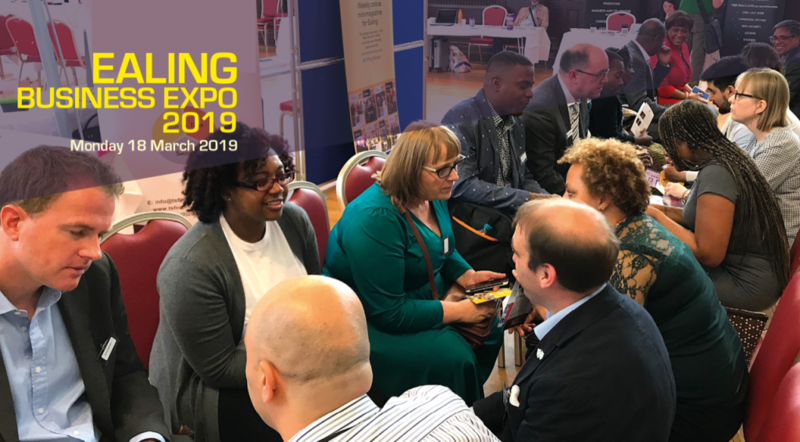 Ealing Business Expo’s six-month build-up, with pre-event networking, exhibitor training, 1:1 brainstorms, and social media tagging and boosting, helps to build up exhibitor connections. The follow-up period ensures that any new connections made are confirmed. Feedback from our past exhibitors tells us that one of the main benefits of exhibiting is the closeness that develops between exhibitors, which encourages business and referrals to take place. The increase in credibility that comes with being associated with the Ealing Business Expo helps new clients to trust them and accept their business offer. We make the cost of exhibiting at the Ealing Business Expo very affordable, compared with other similar business shows, with early-bird discounts and limited-edition shared/display stands available; it is also possible to upgrade to full or part sponsorship levels to maximise the exposure benefits. people who can refer your business to potential customers. Because most attendees will be present with their “business hat” on, and because so many business people understand the dynamics of a business referral, these are more likely to occur on a day like Expo day. If you want to exhibit at an expo, read my ultimate cheat sheet for first-time exhibitors. Minal: How should visitors use an expo to expand their networks? Bring plenty of up-to-date business cards to exchange during face-to-face interactions such as speed networking. Study the Expo Guide (often available online pre-event) and make notes of sessions or stands that you feel drawn to, or that may have synergy with your own business. Engage with the event hashtag on social media to reach people who may not be at the event at the same time as you, or who are watching remotely. Use the hashtag when you post photos and videos. Finally, retweet/share/like/reply to other posts that include the event hashtag. Minal: What are your top three tips for exhibitors to get the most from expos? Attend an exhibitor training course so you work out beforehand what you would like to do on the day. If the expo itself doesn’t offer training, find a course somewhere else. Create a marketing plan well in advance of the day, and refer to it regularly. There’s no doubt that “the money is in the follow-up”, so engage, engage, engage: on social media, LinkedIn, by email and 1:1 meetings. Minal: What should exhibitors be doing to raise their profile before, during and after expos? Carlene: Before an expo, the main thing that exhibitors should do is read the correspondence from the event organiser and take the lead from there. For example, the Ealing Business Expo’s monthly “Exhibitor News” comes with tips for preparing for the Expo, practical tips to keep handy on the day (such as wear comfortable but classy shoes, as you’ll be standing all day but still want to look neat and professional), and updates to the event schedule so everyone knows what will be happening on the day, and during the build-up to the day. Join online tweetchats (#ExpoHour; #RetweetSaturday, #MeettheExhibitors). Offer and present a prize for a raffle. Share the ‘I’m exhibiting’ expo logo on their website, email newsletter, email signature, shop window, printed marketing materials. Attend exhibitor meetups in person. Invite clients to meet them at the Expo. During an expo, exhibitors will be welcoming to visitors, but they should also take the time to look around the venue and visit other stands. By posting photos and videos on social media during the day (using the event hashtag of course), they can encourage their followers to attend, as well as increase profile through social reach. Hundreds of “switched-on” people are expected to come through the Expo door, and to walk past the stands – if an exhibitor can make the most of the opportunities that come up there, s/he will have a successful event. After an expo, the exhibitor should remember to follow-up hot and warm leads, thank visitors for stopping by, and make the most of any business cards and contact details collected on the day. Feeding back both positive and negative aspects of the event to the organiser is also important, especially if it creates the kind of atmosphere where the organiser would be happy to continue to refer your business long after the Expo is over. Minal: How do you think expos bring communities together? Local expo, local suppliers: from caterers to leaflet distributors to welcoming staff, many services are best sourced from suppliers who are in close physical proximity to the venue of the Expo. It is good for the community to ‘own’ the Expo in this way, as it helps them take pride and ownership in it. Research has shown that out of every pound spent supporting a business, 90p is returned to the local economy, so if thousands of pounds of business is created by the expo, it means a lot of that money stays in the community and contributes to the overall wealth of the neighbourhood. Because of their popularity and easy-to-attend format, expos are a great way to draw local businesses out. This is especially true for those who hardly attend events, as expos are a quick way to drop in to connect with other business owners. It’s a safe, local environment to find new suppliers, staff or even learn about the competition! 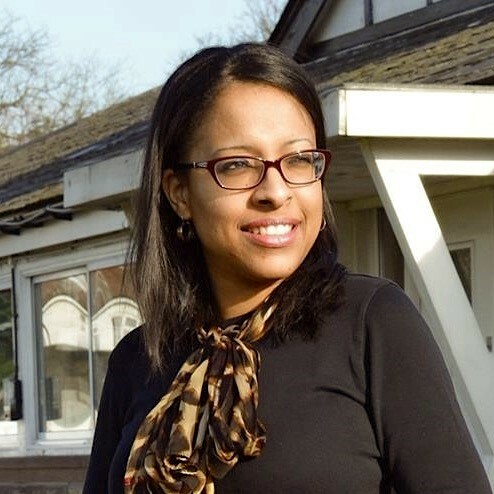 Minal: Tell us a bit about what visitors and exhibitors can expect from the Ealing Biz Expo. Wake up, send a few emails and post a bit on social media, invite colleagues to meet up at the Expo, and head down to the venue on Ealing Common. Study the event schedule on the way, or grab a printed Expo Guide when she arrives, and look through it to see who is speaking about what, when, and which exhibition stands she’d like to visit. Have a first look round the exhibition space, stop for a coffee and a nibble and a chat, and post about the event on social media. Join in with the speed networking; maybe have a couple of quick 1:1 meetings afterwards. Go back and speak some more with exhibitors who caught her attention earlier and arrange follow-up meetings and sign up for their special offers. Attend as many presentations as she can fit into the time; add a bit more to social media. Stay for the post-expo social and see what final connections can be made. Up to 500 people attending the event. 30+ exhibitors to meet and connect with, many of them sharing special offers and giveaways. Two, hour-long speed networking sessions (spaces are limited; please pre-register on Eventbrite). Several first-class speakers, including Will Butler-Adams from London’s high-innovation company Brompton Bicycle; and Great British High Street champions John Martin and Rhian Aubrey-Martin, of John Martin Estates on Pitshanger Lane. Tea, coffee, cake, a bit of lunch perhaps, and a bit of a social at the end. I hope you’ve been left with no doubts about why business expos are great for small businesses. We’re all under time pressures every day and to be able to get this much out of one day is fabulous. Especially when it leads to new customers for your business. I’d love to know if which expos you attend. Tell me in the comments below.